These gloves are consistent with the major brands we’ve carried—Tour Master, Joe Rocket, etc, so hopefully you’ve had some experience with buying gloves and can choose based upon the fit of a previous pair. If you have no previous experience with glove sizing, go here for help. 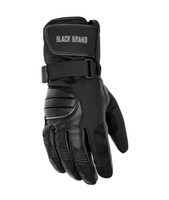 Black Brand says: A perfect combination of winter-weight textile and leather make these gloves waterproof, but still offer a good grip on the handlebars. A Thinsulate™ liner, dual adjustment straps and reflective piping add to the value of the Crossover.